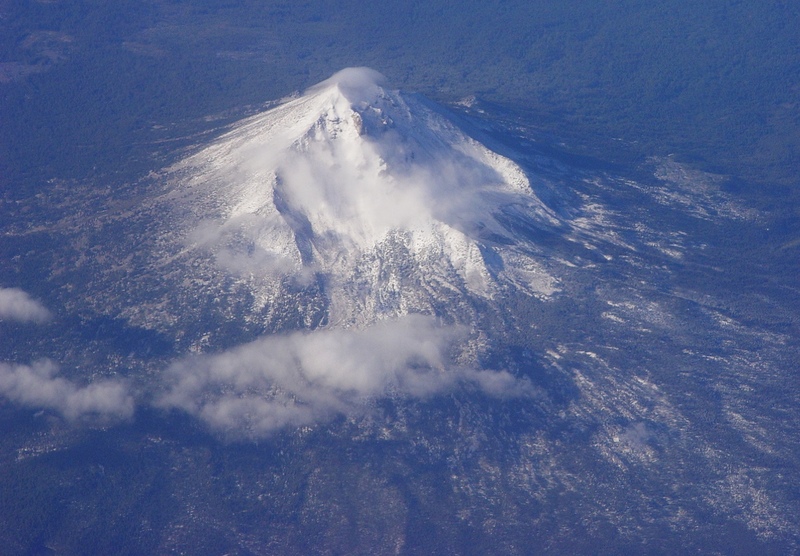 Can You Name the Third Highest Cascade Volcano? Can you name the second highest? How about the highest? It's probably not a fair question for most of you. I've always had a mind for the elevations of mountains, having memorized them effortlessly throughout my life, ever since I learned of the existence of topographic maps. I've even been irritated at the advent of the GPS system because they recalibrated the official heights of many of the iconic mountains of my youth. It's confusing. The Cascade Range extends from the Lassen Volcanic Complex in Northern California to Mt. Garibaldi in the southern part of British Columbia. The chain of active volcanoes is the result of the subduction of the Pacific Ocean crust beneath the North American continent. Portions of the oceanic crust melt and rise towards the surface. Once in awhile one or the other volcanoes erupts as did Mt. St. Helens in 1980 and 2004, and Lassen Peak in 1914-17. Others are less active, but they are close enough to population centers to constitute a serious hazard. The highest volcano in the chain is Mt. Rainier in Washington at 14,411 feet (4,392 meters). It was actually much higher, perhaps 16,000 feet, but debris avalanches and glacial erosion have torn away the older summit. The mountain has more glacial ice than any other mountain in the lower 48 states, and an eruption combined with melting ice would present a huge threat to the urban areas in the southern Puget Sound. Mt. Shasta (14,162 feet; 4,317 meters) is the second highest Cascades volcano, and the most voluminous stratovolcano in the chain (two basaltic shields, Medicine Lake Highlands and Newberry Crater have an even greater volume). It has erupted roughly every 600 years with the last eruption about 200 years ago. Now this is where things get sticky. The third highest peak in the Cascade Range is normally taken as Mt. Adams in Washington at 12,280 feet (3,740 meters). But it all depends on how you define "mountain" or "volcano". 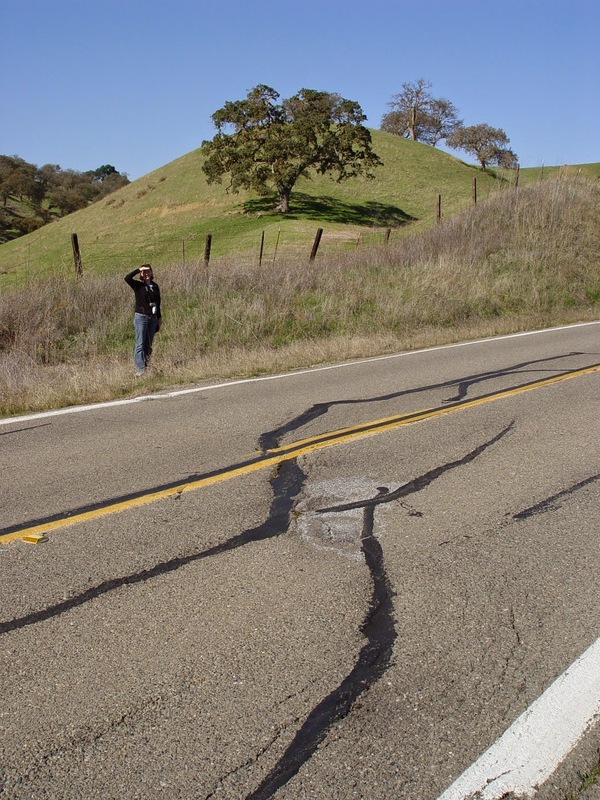 Geographers often consider a hill to be a mountain if it has a prominence of 400 feet or so. By that measure, a subsidiary peak on the summit of Rainier, Liberty Cap (14,112 feet; 4301 meters) is the third highest peak in the Cascades, but it isn't a separate volcano. That honor goes to the volcano in all of these pictures that I took over the last two days while traveling home through Northern California. It's the peak that never gets enough respect. Even the name is diminutive: Shastina. Shastina rises to a height of 12,355 feet (3,760 meters), and has a prominence of 450 feet from the main cone of Shasta. It formed in a series of eruptions about 9,800 years ago. Clouds covered the main summit of Shasta this weekend, so Shastina stood out as a separate and unique peak as we drove south. On other trips, it doesn't dominate the skyline in quite the same way, but it is still a huge mountain. It's the flattened peak on the right side of Shasta in the picture below. In you mind's eye, you could erase the main summit and still see an awesome volcano. There is a grand and momentary sight to be had if you are driving south on Interstate 5 about seven or eight miles north of Medford, Oregon. If the weather is clear when you round the last bend before the Rogue Valley, a beautifully symmetrical volcano comes into view. It is called Mt. McLoughlin. It's really quite dangerous for geologists to drive on this highway because of our tendency to swerve and hit the brakes the moment we see the volcano and start scrabbling around trying to find the camera. I get honked at a lot by angry truckdrivers all the time around that moment. Luckily for me, Mrs. Geotripper was riding shotgun today, and I knew the corner was coming up. She got the camera ready ahead of time and was able to snap a couple of pictures. With the news of volcanoes erupting around the world at the moment (check out Mt. Etna in Italy and Krakatoa in Indonesia, for instance), it's not surprising to consider for a moment that McLoughlin looks like it's erupting. What we are seeing here is clouds forming as warmer air masses are blown upslope into colder air around the summit. The cooler temperatures cause the humidity to jump and condensation forms the clouds around the volcano summit. Sometimes the clouds are more lens-shaped (lenticular), giving rise to legends of UFO landings and aliens. Mt. McLoughlin is 9,495 feet (2894 meters) in elevation and can best be described as a composite cone, as it is in part a basaltic shield with a prominent summit cinder cone and andesite flows. It has not erupted in the last 20,000-30.000 years and thus appears to be low on the list of recognized hazardous volcanoes. From some angles McLoughlin is a deceptively symmetrical cone. The summit has been deeply carved by glaciers. Mt. McLoughlin is soon lost among the trees, buildings, and powerlines of Medford. It's not a particularly worrisome volcano although it is capable of wreaking havoc if the unlikely ever happens. But if you keep driving south on I-5, there are highway signs pointing to a volcano, or more correctly, a caldera, that is not visible at all from the freeway. It's Crater Lake, and it is a much more dangerous volcanic complex than McLoughlin. It erupted catastrophically only 7,000 years ago. And farther south still is Mt. Shasta. It looms menacingly over Northern California, and we'll have a short look at it in our next post. If there were a single thing about our planet that I could guess that the deities made for pure visual pleasure, it would be the butterflies. I'm not aware that they are an environmental scourge anywhere (I'm kind of disregarding their caterpillar stage of life here), and they come in such a stunning variety of colors and patterns. I'm pretty sure that if they ever thought of such things, they would probably disagree with my assessment, since their lives are filled with the necessity of reproducing and all. We've been pretty hard on butterflies. The prevalence of pesticides in my region has thinned their ranks to the extent that I rarely see them despite spending a lot of time outdoors. The famous migrating Monarchs have suffered a population crash in recent years, in part due to habitat destruction and climate disruptions. In any case, I was at the Pacific Science Center in Seattle Washington today and was quite entranced with the butterfly enclosure. Out came the camera, and I offer you this gift of color on the day after Christmas. May you have a new year of peace and justice. First, you have to find rock seeds. Try for variety, a mixture of igneous and metamorphic, maybe some sedimentary. Local rivers are good places to look. They're even shaped a little bit like eggs. Then you have find a good place for your rock garden. Any vacant lot has potential, but some are better than others. I picked this one because it is right next to the Great Valley Museum at Modesto Junior College. 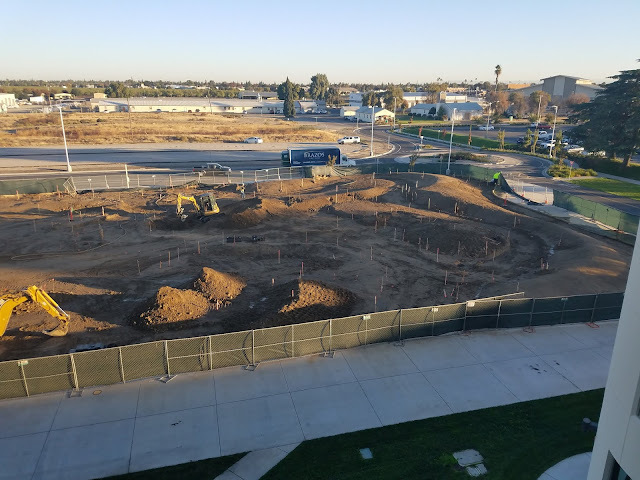 If we can get a good rock garden going, it can enhance the mission of the museum and college by providing a microcosm of the geologic environment of our region. Ah! Water. For the rock garden to truly thrive, try adding lots of water. That will really get those rocks sprouting. And now we wait. And we wait. You can even walk around the hummocks to see if any of the rocks are peeking though yet. But don't cheat and try to dig them out ahead of time. They might stop growing entirely. Then comes that magic day when you arrive at work and find that the rocks have sprouted! They're huge!! It's now safe to wander about a little, seeing what kind of rocks have germinated. 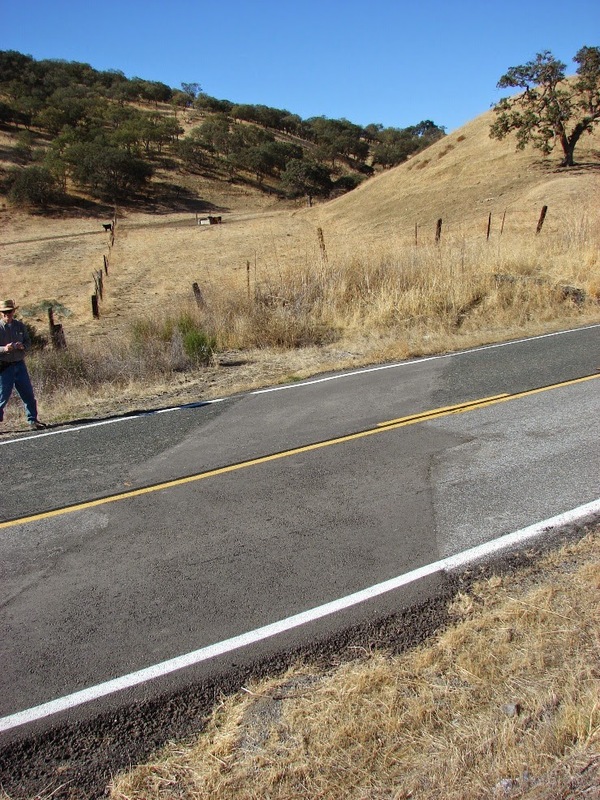 I saw some tombstone rocks like those of the Mother Lode foothills, giant boulders of marble from the Calaveras Complex, and even a giant chunk of quartz, the ore-bearing rock of the Mother Lode gold veins. There were also some volcanic rocks from the Table Mountain Latite and the rhyolite tuff of the Valley Springs Formation. It's a great crop, which is good because no one is going to want to try moving these rocks once they've grown. Finally you need the skilled rock farmers, who like bonsai tree tenders adjust the location of the boulders and plant some of them a little deeper so they won't fall over on anyone. And that's how you make a rock garden! I understand that some of our botanists and biologists are intending to...um...plant plants on these beautiful rocks. I have mixed feelings about this, but they say it will enhance the education of the children who visit the museum every bit as much as the rocks will. I guess time will tell. Wait a Minute...What Happened to the Rocks I Picked Out? And here (below) is the rock they claim I picked out. This after nearly two weeks of rain and cooler temperatures. This rock is clearly on a PALLET of LIES! Well, okay, maybe it isn't on a pallet like the others, and maybe it is the same rock I picked out. But you can now see one of the main reasons I picked it, and why it will be sitting in a position of honor by the entrance sign to the outdoor nature lab. Not only is it a unique rock that is found in our region (the latite of Table Mountain), it is also a miniature ecosystem of mosses, lichens, grass, and other organisms. To see it, just add water! In any case, we now have an astounding variety of the rocks that are found in our region. There is marble from the Calaveras Complex, the host rock of the many caverns that are found in the Sierra Nevada foothills. There is a gigantic chunk of the quartz from the Mother Lode veins, the source of the gold that played such a huge (and devastating) part in the history of California. Sorry, no visible gold (although I'll keep looking). One of the most striking rocks are the "tombstone rocks" of the Foothills Terrane, large fins of slate and phyllite that were once mud and silt on the ocean floor. The rocks were crushed against the western edge of North America, metamorphosed, and tilted vertically. We'll be putting them in the ground in the same vertical orientation. It will be a dramatic sight at the southern entrance to the lab. The next step comes at the end of the week. I'll get to help direct the placement of the rocks! I'll try not to be insufferably picky..."Could you rotate that one about four inches? Great! Wait...I liked it better the way it was...". An update will follow. I've been leading geology field studies trips to lots of places in the American West for 30 years and started to take digital pictures in 2001. I sometimes struggle to find new things to photograph when I visit a place for the 30th time, but in some cases it is not a problem. There are geologic changes that happen on a yearly basis, and with sixteen years of photos, the changes become obvious. This is a continuing update from a post in 2013, and I'll probably continue updating for the foreseeable future. Highway 25 in the California Coast Ranges connects the town of Hollister with the access road to Pinnacles National Park (formerly Pinnacles National Monument). 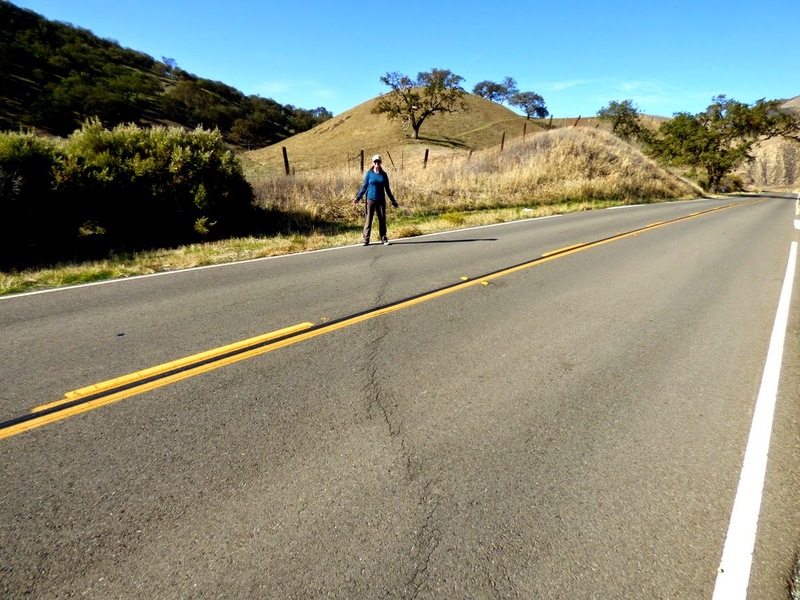 Along the way the highway crosses the San Andreas fault in a section where the fault creeps an inch or so each year (36°35'54.27"N, 121°11'40.19"W). 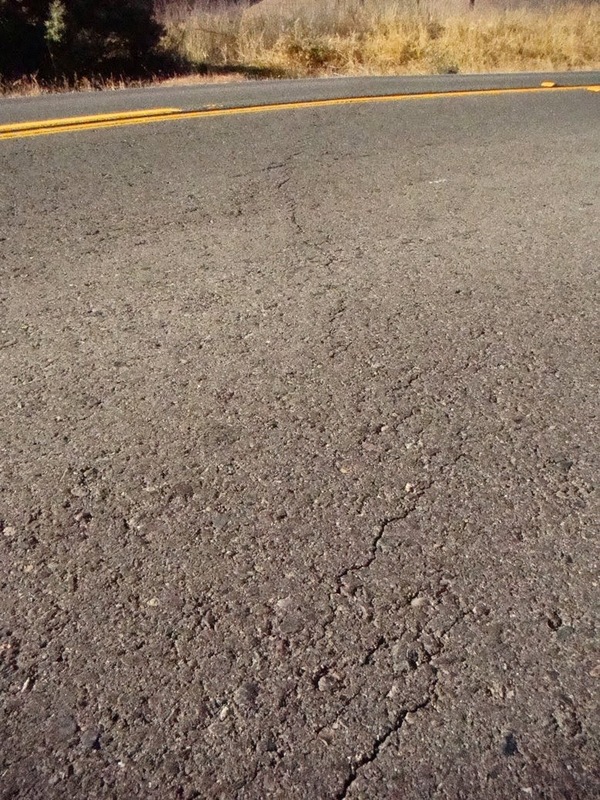 Most years we've stopped to have a look at the effect the movement has on the pavement. In 2002 and 2004, the damage was obvious. 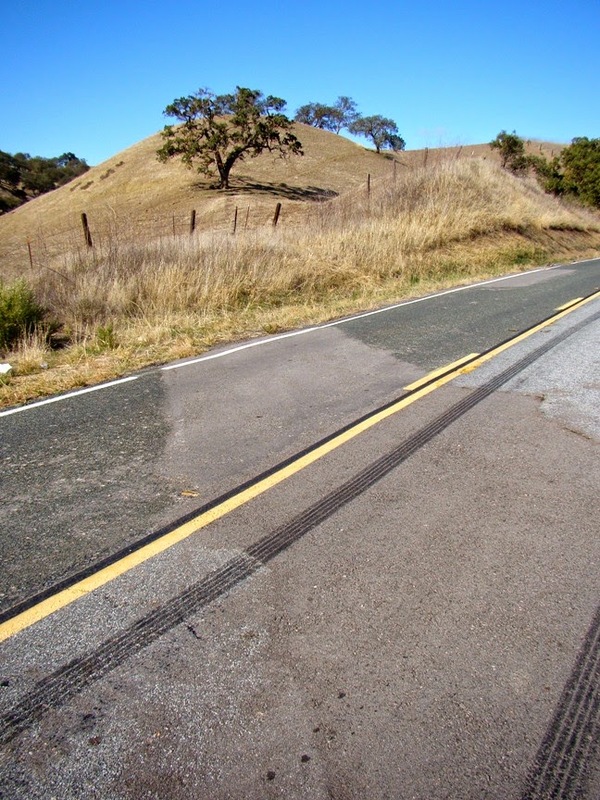 By 2008 someone had patched the road, and no fault motion was evident. Little damage was evident in 2009 either. 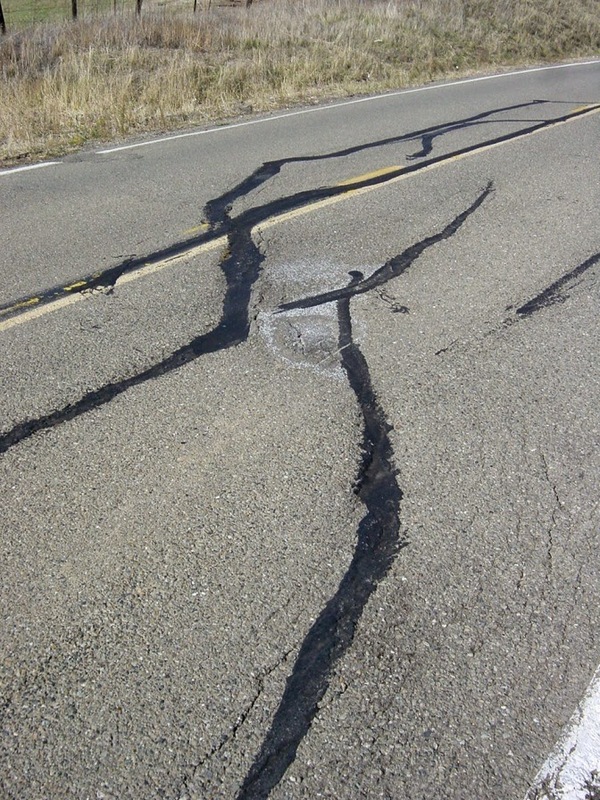 But by 2010 cracks had begun to appear as the fault stressed the pavement. The fact that the fault creeps in this region is a good thing. It means that stress is not building along the fault surface, but instead is being released gradually. The sections of the fault to the north and south of the creeping section are locked by friction, and are building up the ominous stress that will eventually produce quakes with magnitudes in the range of 7.5 to 8.0. The quakes are coming and we need to be as prepared as possible. 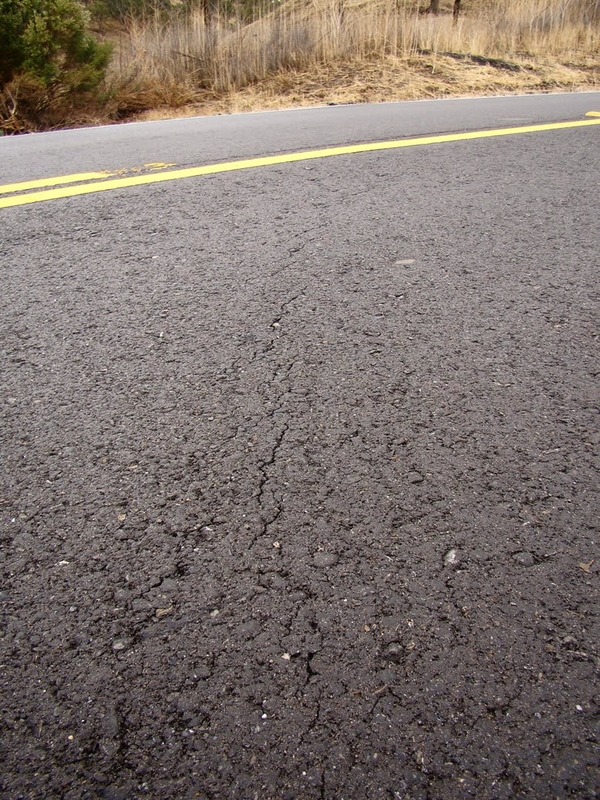 By 2012, the road had been completely repaved, and yet the shearing was already evident. It became even more pronounced by 2013 and in 2014. Just by chance, the person working as a scale was the same individual as in 2004. In 2015 the fractures were moderately larger. They'll need to start thinking of road repairs before long. In 2016 Laura once again provided scale, as she did in 2014 and 2004. Here in 2017, long-time trip volunteer Mary provides scale. 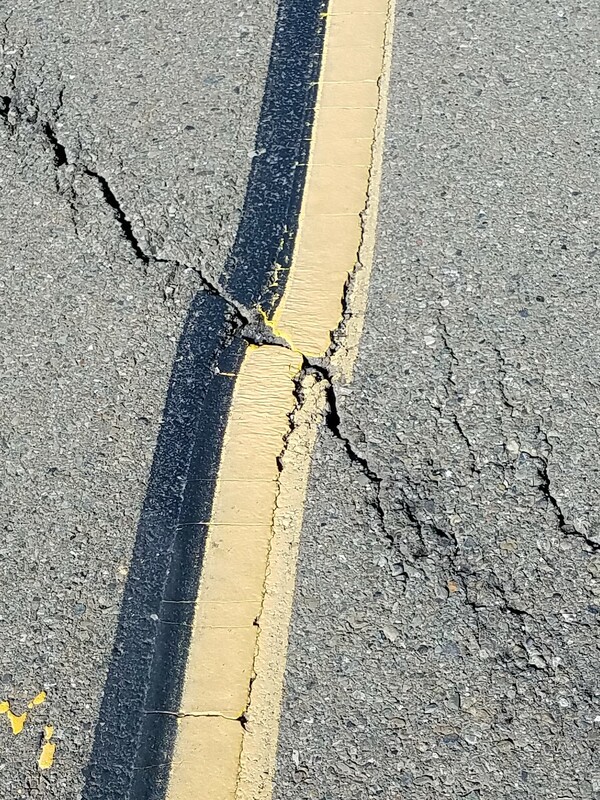 The cracks in the road are just a bit larger, but they didn't look appreciably different than the previous year except for a twist (pun intended). And so we come to Sunday's (Dec. 2, 2018) look at the road. The break to my eye seems more continuous. 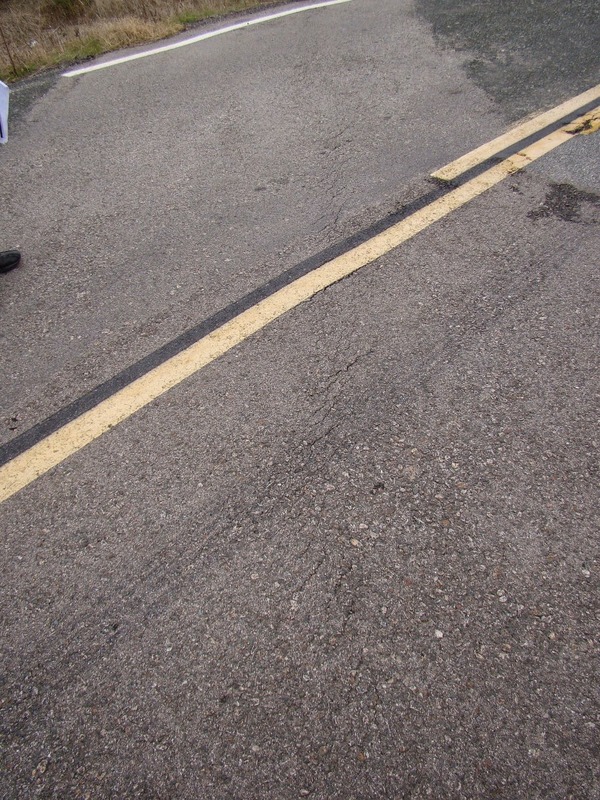 It's now been six years since the road was completely repaved. Last year the paint was deformed (twisted), but not split (below). As predicted, the break in the paint is complete! These little changes that happen at a rate visible in human lifetimes add up to huge changes when multiplied by thousands or millions of years. The nearby eroded volcano of Pinnacles National Park has been displaced 195 miles (315 kilometers) in the last 20 million years or so by movement along the San Andreas.